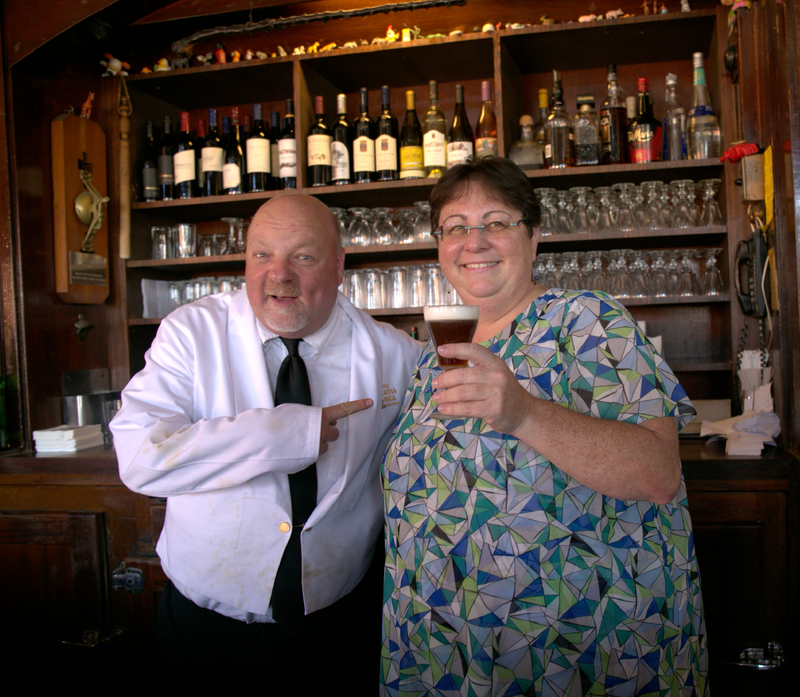 When Sara Russell was a kid, her mom would bring her to the Buena Vista Cafe across from Aquatic Park and regale her with stories of the bar's history and its famous Irish coffees. "Her and her friends would take the Hyde Street cable car, because back then [in the 1960s] it was a local thing, and she'd come here and get an Irish coffee," said Russell. The small bar was a glamorous place filled with true stories and tall tales. As an adult, Russell has come back here on dates. "And I was always told that the Irish coffee was invented here, in this place, in San Francisco," she said. Now, she wants to know if that story is totally accurate. 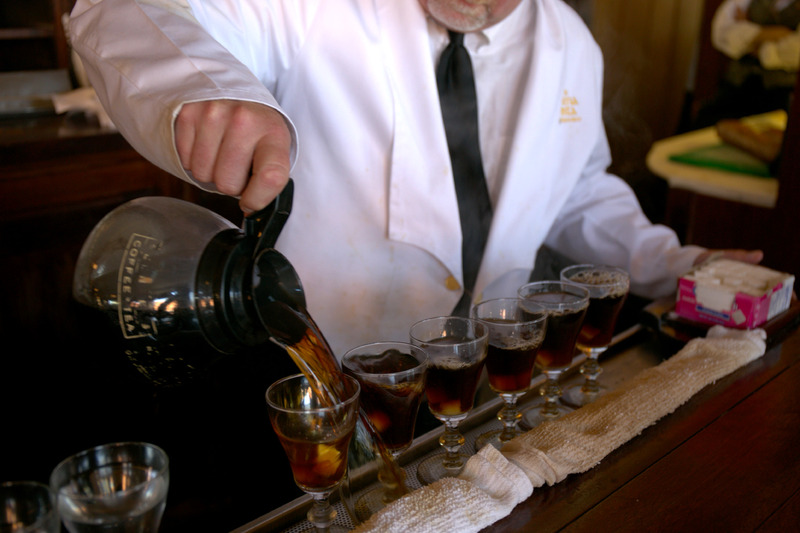 Was Irish coffee invented in San Francisco? On a regular day, the Buena Vista serves around 2,000 Irish coffees—up to 2,500 on a busy weekend day, said Lea Hausherr, who has been a waitress there for 14 years and is the informal historian of the place. As we watched, the bartender lined up hot glasses all the way down the bar, filling each with hot water. After pouring the water out, he replaced it with two sugar cubes and topped that with hot coffee, which the bar goes through so quickly that it always stays fresh. Then the bartender stirred up every glass, “like Bob Marley,” he added. As he stirred, he splashed a little bit of the drinks out here and there, to make sure each cup looked the same all down the bar. Irish whiskey, always Tullamore Dew, was next and then cold heavy cream spooned on top. And there you have it: the famous Irish coffee, reportedly invented right here in this bar. As Russell, Bay Curious host Olivia Allen-Price and I all sipped our Irish coffees, Hausherr told us the legendary tale of the drink. "It was not originated in San Francisco. But it was introduced first in San Francisco to America," she said, right here at the Buena Vista 65 years ago. "It was 1952, it was a dark and stormy night, Nov. 10 to be exact," said Hausherr. "The owner of the Buena Vista at the time, his name was Jack Koeppler, he was behind the bar." Sitting at the bar was the popular San Francisco Chronicle travel writer of the time, Stanton Delaplane, who had written many columns about this amazing drink he'd had at the Foynes airport in Ireland: Gaelic coffee. Click on the images to read Delaplane's "Postcards from Shannon" in the Chronicle. That night, the two of them set about trying to replicate the drink. "They tried it, they tried different glasses, they tried different whiskeys, they tried everything they could think of," said Hausherr, "but the cream kept falling down to the bottom." Eventually, Koeppler became so obsessed with perfecting the Irish coffee that he even flew to the original source: the Foynes Flying Boat terminal, which later closed and was replaced by the nearby Shannon airport. It was at the Foynes terminal that cook Joe Sheridan reportedly invented the drink. And that brings us to the other half of the story. According to the Foynes Flying Boat Museum and the story Hasherr passed on, the drink was invented on another dark and stormy night a decade earlier in 1943. A Pan Am flight headed to New York was forced to turn back in the bad weather. When it pulled into the Foynes terminal, the cold and tired passengers disembarked. "They wanted to warm up the Yanks," said Hausherr. Sheridan was a cook at the time, and whipped up the perfect drink to keep the Yanks warm and awake: coffee with Irish whiskey and a little extra sugar and cream for the American palate. What is this, asked one of the passengers, Brazilian coffee? No, he said, it's Irish coffee! It was Sheridan who Buena Vista owner, Jack Koeppler, visited 10 years later looking for help making his own authentic version to bring to San Francisco. Sheridan aided the project and even came over to San Francisco, though it's unclear if he worked at the Buena Vista. Either way, Sheridan stuck around, and when he died, he was buried in Oakland. 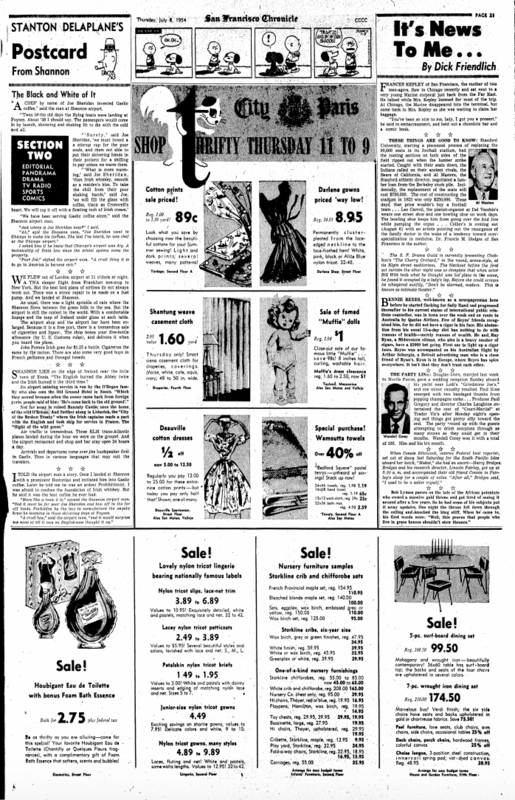 The final recipe Koeppler settled on used aged cream from the San Francisco mayor at the time, who also ran a dairy. To fluff up the cream and help it float, Koeppler added more sugar and a healthy dose of heavy whipping. "We now have what they came up with in 1952. It’s been the exact same recipe all this time," said Hausherr. "That's the most widely accepted version," said Eric Felten, author of "How's Your Drink?" and a former drink columnist for the Wall Street Journal. But Felten has two problems with it. First, Felten is not sure that Joe Sheridan really invented the drink to warm up passengers at an airport one night. "It’s possible the drink was actually invented in 1940 or so at a pub called the Dolphin in Dublin," said Felten. This is based on an account from a Harvard professor of Irish Studies, and on the argument that the cream and sugar were more reasonably added to disguise the taste of coffee during World War II than to warm up passengers one night. However it started, the drink likely spread quickly to the airport (or it's even possible that Sheridan had the drink, or a similar one, while living nearby in Dublin and drew his inspiration from it). 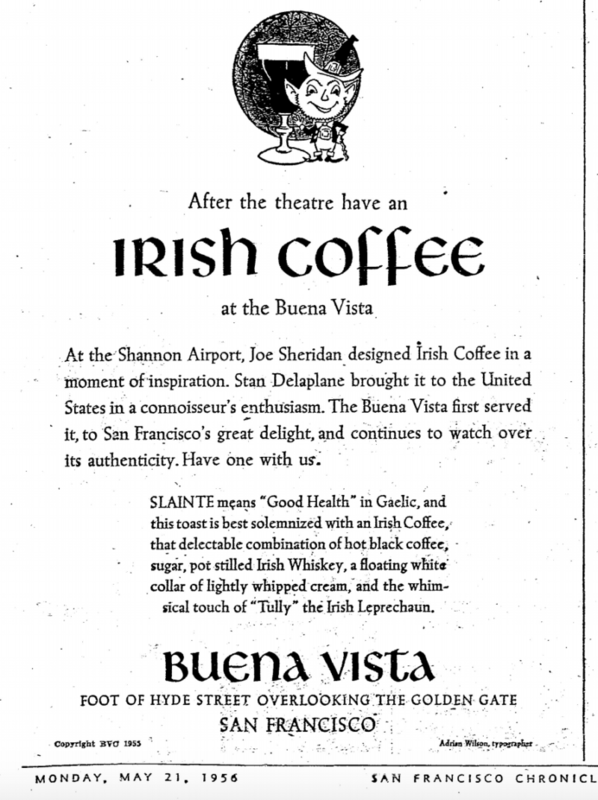 Ultimately, though, it was from the airport that Irish coffee went out into the wider world, as travelers like Delaplane brought back word of a special kind of coffee mixed with whiskey, sugar and cream. The other hiccup in the Buena Vista's tale, though, is that Delaplane isn't the only traveler who brought word back to the U.S. 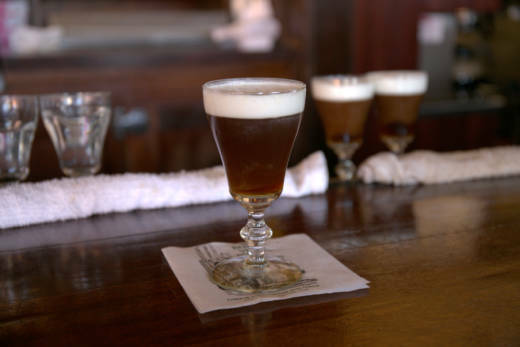 There's historical evidence that Irish coffee made its appearance in New York four years before that fateful night at the Buena Vista. "The first instance I can find of the Irish coffee coming to the U.S. is the food critic for the New York Herald Tribune, named Clementine Paddleford. 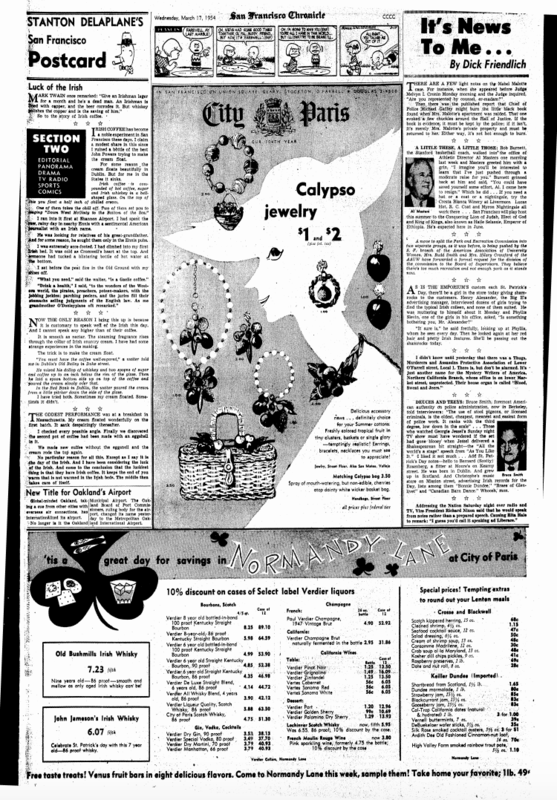 For her St. Patrick’s Day column in 1948, she talks up the Irish coffee and she gives the recipe. It’s clearly the Irish coffee we know," said Felten. However, Felten does note that it wasn't in New York that the drink really gained popularity or caught on. "It is the case that it's in San Francisco that the Irish coffee really became a sensation," he said, "thanks to Stanton Delaplane." And thanks to the heavy marketing by the Buena Vista, like this ad they ran in the 1950s, the drink gained popularity. Felten was also impressed with how the cafe has maintained that recipe over the years. "I was in San Francisco and went to the Buena Vista to have an Irish coffee, and I was extremely pleased with how good a drink they were making," he said. A confession: Our Bay Curious host, Olivia, had never had an Irish coffee before she was enlisted to drink many of them -- for the sake of investigative reporting. She's now a convert. "It's amazing," she said, after sipping her first. "Creamy, yummy, silky, good," agreed Russell. And what did our question-asker think about the nearly true story of its origins? "I think it tastes great and it doesn’t matter what the story is. I was just curious," she said. Fill glass with hot water to heat it up, then dump out the water. Pour hot coffee over the sugar cubes, to fill about 3/4 of the glass. Stir until the sugar is dissolved and mixed. Add Irish whiskey with a bit of room left in the glass. Spoon heavy, cold cream on top.